In June 2016 I spent five days in Geneva and south east France, travelling in the footsteps of the Shelleys (the details of which – including the Shelleys’ experience, and my own experience, of the Mer de Glace – will be a future blog). On the third day I met Professor David Spurr from the University of Geneva at the Bodmer Foundation Library and Museum. Spurr had kindly agreed to show us around the current exhibition: Frankenstein: Creation of Darkness, which he curated. As my partner and I drove across the border from France into Switzerland, and around the beautiful Cologny area of Geneva, we caught a glimpse of Mont Blanc in the distance, a momentous sight; our trip to Chamonix the day before had been so cloudy, rainy and misty that it had seemed as if the mountain was determined to hide from our view. We welcomed the sunshine and we arrived at the Bodmer, which is in a stunning location, and well worth a visit. It opened in 1951, and was initially a research library, but in 2003 an exhibition space was opened, which in itself is an amazing piece of architecture. 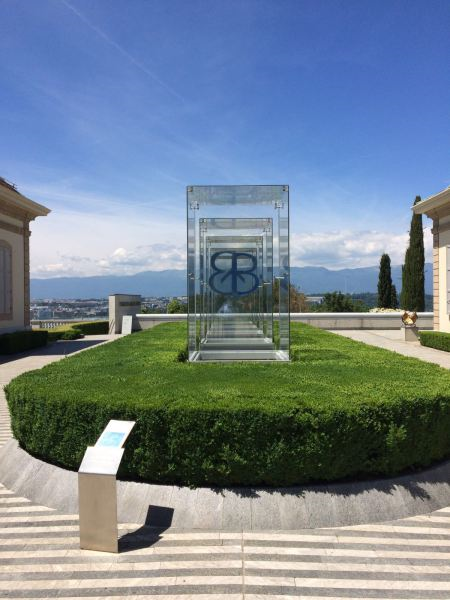 The exhibition provides a journey, in which you firstly encounter the Shelleys’ works, and then the connections within those works to Geneva itself. We are presented with contemporary scenes of Geneva (in order to understand the Swiss town as Mary would have seen it), and the more unchanging forms of the French Alps. 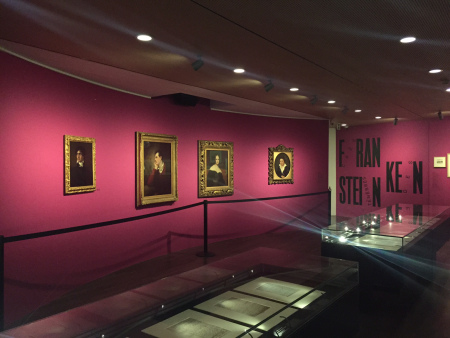 These images are placed on the wall alongside a large glass cabinet holding the treasure of the exhibition: the Frankenstein draft notebooks. The pages on show include the section that would become Vol II, Chapter II of the 1818 Frankenstein where Mary Shelley quotes Percy Bysshe Shelley’s ‘Mutability’. It was exciting to see the original draft of this page, as I often use the manuscript facsimile version in my research. What is fascinating here is that Mary inserts poetry so seamlessly into her dense prose descriptions of Victor’s solitary Alpine travels and fluctuating moods. Moreover, that poetry is composed by her partner Percy Shelley, who then goes over the draft of the novel and makes occasional suggestions to aid her in her task. Within the Frankenstein notebook (which can be also be viewed online at the Shelley-Godwin Archive), you can see how Percy Shelley glosses Mary’s original language, something which is endlessly fascinating. One mood or modulation like the last. Nought may endure but Mutability. P B Shelley, ‘Mutability’ (1816). Verses 3 and 4 appear in Frankenstein. Another particular highlight for me was Mary Shelley’s journal – open on the page which shows her first reference to the composition of Frankenstein – ‘write my story’ (24 July 1816). The bicentenary of this journal entry will be celebrated at an upcoming event I am organising at York and the Keats-Shelley House this month. The choice of which pages to display from these hugely important holographs has been executed wonderfully at the Bodmer exhibition. Mary’s journal has no facsimile (although there is a brilliant print edition, edited by Paula R. Feldman and Diana Scott-Kilvert), so to see a volume of it was a powerful reminder that it is a tiny book, heavily worn and containing some of her less decipherable jottings. Some of the exhibits on display are on loan from libraries in the UK, such as the Bodleian and the British Library. Others belong to the Bodmer’s own collection. I was particularly excited to see Mary Shelley’s inscription in the copy of the novel she sent to Lord Byron. This was on sale a while ago at Forbes and eventually went for at least £350,000. She writes: ‘To Lord Byron / from the author’ . 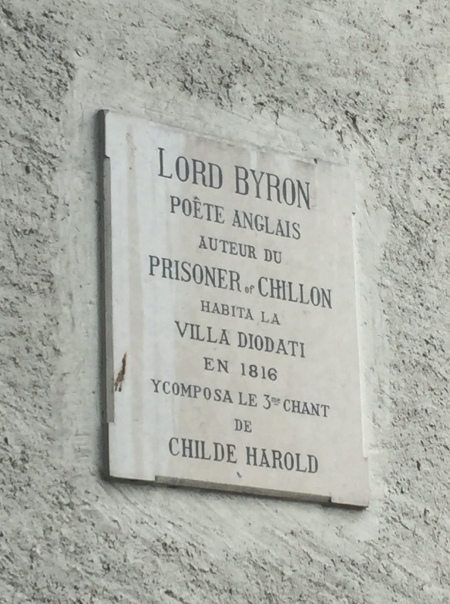 Her characteristic modesty is evident here, and to be confronted with this edition reminded me of the complex relationship Mary Shelley actually had with Lord Byron, as she was a major copyist for his works, including The Prison of Chillon and Childe Harold’s Pilgrimage Canto III. Also on show at the exhibition is the letter from Lord Byron to John Murray explaining that Mary Shelley wrote Frankenstein (Murray being the publisher who first rejected the work). 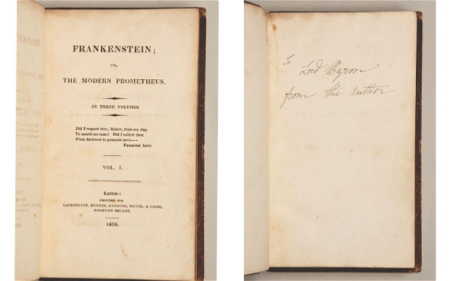 Frankenstein was published anonymously on January 1, 1818: Byron’s choice to reveal her authorship here is testament to his respect for Mary Shelley as a writer, and his determination to deliver her the credit she deserves. Other literary texts from the period are displayed, including Jane Austen’s Emma (which first appeared in 1816), Polidori’s diary (a subjective record of the infamous events at the Villa Diodati in the summer of 1816), and a copy of Fantasmagoriana (the collection which prompted Byron’s decision to announce a ghost-story competition). Other more idiosyncratic items include the weather report from Geneva in the summer of 1816, showing low temperatures of 7-10 degrees: indeed, it was the year without a summer. Considerable attention is also paid to the relics of Frankenstein as a stage production, including the various castings of the creature. 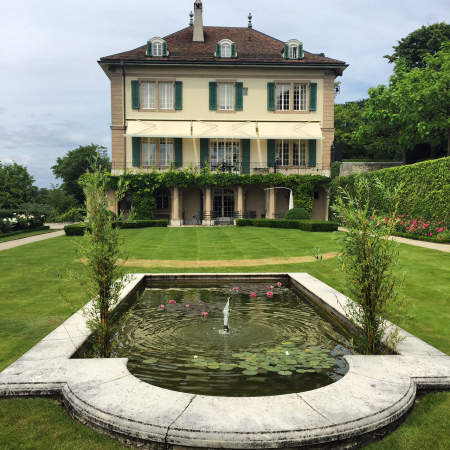 Spurr gave us fantastic anecdote-enforced fragments of the Shelleys’ history and the story of the exhibition, and then took us along to the Villa Diodati (a 5-minute walk), where we were treated to a stroll round the gardens. The house is privately owned, but beautifully cared for (as we were told) in a way that is in keeping with its momentous history. It is worth noting just how well the literary texts were placed on display at the exhibition in Geneva, a difficult feat for any curator, as old books are not as blatantly striking as other forms of artwork. This many Shelley texts have not been on display together since Shelley’s Ghost at the Bodleian. 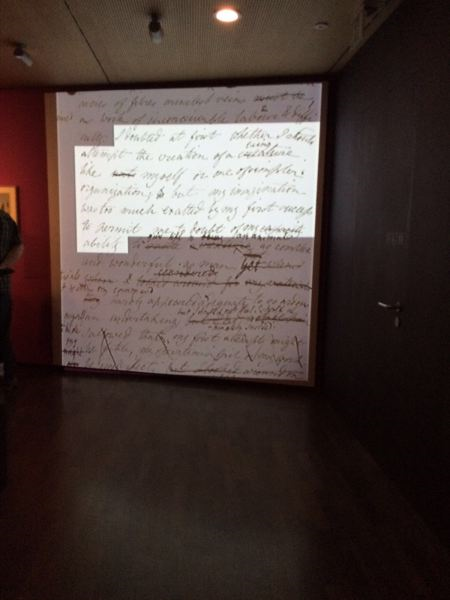 Other non-Shelleyan exhibits include a display of the texts the creature initially reads and learns from: Milton’s Paradise Lost, a volume of Plutach’s Lives, and Goethe’s The Sorrows of Young Werther. 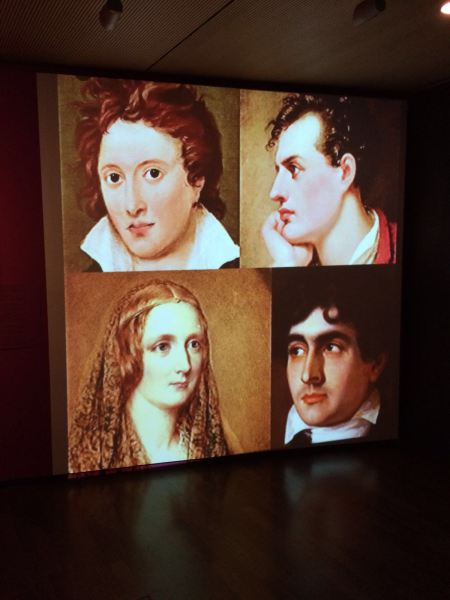 Editions of Rousseau remind the visitor that Lord Byron and the Shelleys were also literary tourists when they first travelled to Switzerland in May/June 1816. The exhibition does a superb job in asserting the powerful contribution and legacy these authors created by composing their own works right there, in Geneva, taking their inspirations from the scenes around them. Moreover, it emphasises the creative stimulation provided by the social environment of reading and intellectual discussion at the Villa Diodati. (Unless mentioned otherwise, all photos are the author’s own).